Back by popular demand! Hamish delights the Naked world year in year out with this sparkling gem. Warm days and cool nights in the hills allowed outstanding fruit development in each parcel. 'Blanc de Blancs' is a French term meaning 'whitest of whites', used to describe a sparkling wine made from 100% Chardonnay grapes. Yes, that's 100% guaranteed scrumptious layers of apple and lime leading to subtle hints of almond, orange and peach. The beautifully defined bead leads to a lingering yet refreshing finish of lemon and lime. 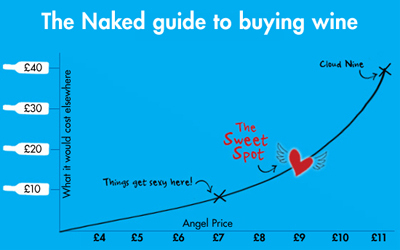 At this Angel price, the fizz won't stick around long on our virtual shelves! This stunner is crafted from 100% McLaren Vale shiraz, and has lifted aromatics of dark red fruits that will draw you in. It's soft yet vibrant middle palate is downright moreish and leads to long chocolatey tannins - yum! Perfect fun wine for any occasion, don't expect a bottle to last if there are a few glasses that need re-filling. 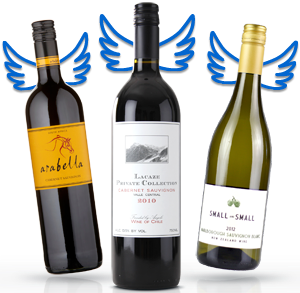 A steal at under $16 for Angels, why not pop a few in your basket? Since the 1990's the popularity of this unique style of wine has grown dramatically. It's a great food wine, and tough to imagine a more perfect Aussie treat on a Spring or Summer afternoon, lunching outside with loved ones.